Ask Happy Dan: What’s the Best Pillow for Me? When you have questions about pillows and other bedding, Happy Dan the Pillow Man is your guy! He’s happy because he always gets a good night’s sleep. 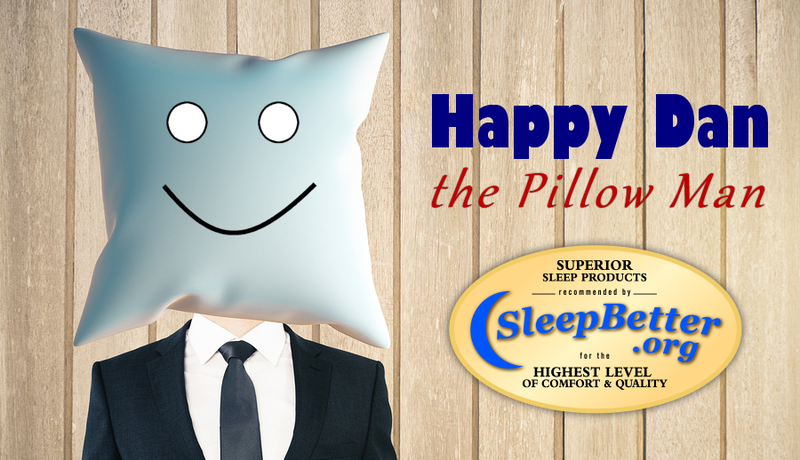 Happy Dan is the alter ego of Dan Schecter, Senior Vice President at Carpenter Co., and the creator of SleepBetter.org. He’s spent 30 years learning about pillows and sleep and how those two items go together, and he’s now available to answer your questions! In this edition of Ask Happy Dan, Dan gives a pillow recommendation. Burdette: With all the different kinds of pillows you make, it’s very difficult to figure out which one would be best for me. I sleep on both my side and back, but mostly on my side. I need a pillow that supports my neck and also doesn’t cause my ear to hurt after sleeping on my side. Can you give me some guidance as to pillow selection? Thank you for your question! We do manufacture and sell a wide variety of pillows, because there are a lot of different types of sleepers. For you, I recommend the Beyond Down Side Sleeper pillow. It should fit you like a glove. So says Happy Dan The Pillow Man! PS: To explore all of our products, please visit our Recommended Products page. Do you have a question for Happy Dan the Pillow Man? If so, follow this link to ask! Note: Some Ask Happy Dan questions may be edited for clarity.